Palestinians didn’t jump into the fray in Syria. They were dragged into it – violently and reluctantly. Here is the story of how and why Palestinians and their 14 refugee camps became strategic targets in the Battle for Syria. A small UNRWA van delivers boxes of staple foods to Yarmouk camp residents who wait at a pick-up point. Bread donated by the Syrian government lies atop the boxes. My first visit to Yarmouk took place a few days after 20 people were killed in the Palestinian camp’s first major shelling incident on August 2, 2012. Residents showed me the damage caused by the first mortar – which hit the roof of a small apartment building not far from Tadamoun, a Damascus suburb where rebels and security forces were clashing daily. As bystanders rushed to investigate the damage, a second shell hit the narrow street outside where onlookers had congregated, killing and injuring dozens. Foreign media headlines suggested the Syrian government was shelling Yarmouk, but Palestinians inside expressed doubt. Some said these were rebel mortars from adjacent neighborhoods, but it was clear nobody could provide definitive answers for what may simply have been a series of stray shells. Yarmouk, once home to around a million Syrians and 160,000 Palestinian refugees, was an oasis of calm that summer day of my visit. By contrast, driving through rebel-occupied Tadamoun, Yalda and Hajar al-Aswad on my way in and out of the camp, one could only gape at the burned buildings and vehicles, shuttered shops, rubble in the streets and makeshift checkpoints dotting these new conflict zones. A year-and-a-half later, in March 2014, I visited Yarmouk again. The camp is unrecognizable now, and the pictures we see don’t do justice to the damage. At the entrance of the camp, I was greeted by armed Palestinians who are part of a 14-group ‘volunteer force’ formed for the purpose of protecting Yarmouk and ejecting the rebel fighters deep inside the camp. The group falls under the umbrella of the Popular Palestinian Committees for the Liberation of Yarmouk. When I ask them where they’re from, in rapid-fire, one after the other, they tell me,“Safad, Lubya, Haifa, Tiberias, Jerusalem, Acca,” though, of course, they’re too young to ever have been to any of these places. That’s where their parents or grandparents hail from. That’s where they intend to return one day. There’s a lone Syrian among them. He was raised in Yarmouk and is a Palestinian as far as he’s concerned. The stories these fighters tell me is nothing I have read in English, or in any mainstream publication outside Syria. Theirs is a story that is black-and-white. Thousands of Islamist fighters invaded and occupied Yarmouk on December 17, 2012, and Palestinians and Syrians alike fled the camp, literally beginning the next day. The militants, they say, systematically destroyed the camp, killed people, looted homes, hospitals – anything they could get their hands on. They insist that the rebels could not have captured Yarmouk without the help of Hamas, and are convinced that Hamas supporters are still inside the camp, now members of Al-Nusra Front, AknafBeit al-Maqdes, Ohdat al-Omariyya, Ahrar al-Yarmouk, Zahrat al Mada’en and other rebel groups that they say occupy the camp. They claim Hamas employed and provided financial assistance to displaced Syrians who escaped conflict elsewhere and settled in Yarmouk. “They hired them for this conflict,” says one. This blurred line has provided Hamas’ political leadership with ‘plausibledeniability’ against accusations that it has aided Islamist rebels in the camps. The fuzzy lines first became clear to me in the autumn of 2011 when a Hamas official confided that they had to “remove some people” from these areas who were displaying increasing sympathy with the Syrian opposition. But back to the Palestinian fighters in Yarmouk. My attention is diverted by the stories one of them tells me about members of the Palestine Liberation Army (PLA) who were assassinated in the lead-up to the occupation of Yarmouk. From the age of 18, all male Palestinian refugees in Syria take part in compulsory military service in the PLA for a period of 18 months. They are trained directly and solely by the PLA, but weaponry and facilities are provided by the Syrian army. Once upon a time, the PLA was also based in Egypt, Iraq, Jordan and Lebanon where their mandate was to cooperate with the host government – today, the only PLA base left in the entire Arab world is in Syria. I head over to the makeshift headquarters of the PLA to find out more. They have temporarily relocated from Moadamiyah in West Ghouta, a rebel-occupied suburb of Damascus. There, I meet with General Hassan Salem and General Nabil Yacoub, two senior officials who report directly to PLA commander Major-General Tariq al-Khadra. The PLA’s mission is “to liberate Palestine” and the generals tell me they “do not play a role in defending [Palestinian] camps during the Syrian conflict.” By all accounts, this appears to be true. But in 2012, the PLA was dragged into Syria’s crisis quite unwillingly. On January 5, Major Basil Amin Ali was assassinated by an unknown assailant in Aarbin – east of Jobar in the Damascus suburbs – while he was fixing his car by the side of the road. Colonel Abdul Nasser Mawqari was shot dead inside Yarmouk the following month, on February 29. A week later, on March 6, Colonel RidaMohyelddin al-Khadra – a relation of PLA commander, General Khadra – was assassinated in Qatna, 20km south of Damascus, while driving home in his car. On June 5, PLA Brigadier-General Dr. Anwar Mesbah al-Saqaa was killed in AadawiStreet in Damascus by explosives planted in his car, under his seat. He had left his home in Barzeh and was dropping his daughter off at university. Both she and the driver of the car were injured. 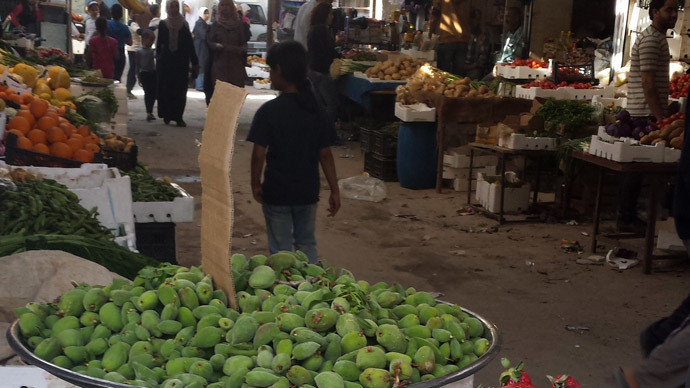 A food market inside Jeramana, one of 14 official and unofficial Palestinian refugee camps inside Syria. A few weeks later, on June 26, Colonel Ahmad Saleh Hassan was assassinated in Sahnaya, also in the Damascus suburbs. General Abdul RazzakSuheim, his son, and a soldier guarding them were killed on July 26 in rebel-occupied Yalda, the neighborhood adjacent to Yarmouk – a week before those first mortars killed 20 residents of the camp. On July 11, in a full-on attack against the PLA, opposition militants kidnapped and killed 14 Palestinian soldiers heading back to Nairab camp on a weekend break from training exercises in Mesiaf, 48km southwest of Hama. According to the PLA generals I interviewed, the soldiers were divided into two groups – half were shot, while the other half were tortured and then beheaded. Many Palestinians I interviewed told the story of the driver of the PLA van – who was not a soldier himself. Ahmad Ezz was a young man from the Nairab camp in Aleppo. The rebels spared him – temporarily – then strapped him into a vehicle rigged with massive explosives, and ordered him to drive into a Syrian army checkpoint. According to multiple Arabic news reports, at the very last minute, Ahmad veered sharply away from the checkpoint. The rebels detonated the explosives and Ahmad died, but by changing course he spared the Syrian soldiers. This isn’t such an odd sentiment. After all, the majority of male Palestinian refugees in Syria have undergone military training by the PLA, under the auspices of the Syrian armed forces. The international media has tended to focus on events in Yarmouk as the ‘one’ Palestinian story inside Syria, but this is far from accurate. There are about 14 different refugee camps in the country, each with its own experiences in this Syrian conflict. I visit Jeramana camp next. It is a small camp on the outskirts of Damascus that blends into the larger Jeramana neighborhood, both now bustling with refugees from other camps and from conflict-hit parts of Syria. Jeramana is peaceful, though mortars, rockets and rebels from nearby BeitSaham, Jobar and EinTerma break the calm every so often. Because militants intermittently try to storm the camp entrances, Jeramana residents also have a ‘volunteer force’ like Yarmouk’s – this one manned by armed men from three Palestinian factions: the Popular Front for the Liberation of Palestine-General Command (PFLP-GC – led by Ahmad Jibril), Fatah Intifada and as-Sa’iqa. One of the fighters that met me at the camp entrance has a broken arm from a recent skirmish with rebels. This is the camp made famous by Angelina Jolie in October 2009, when she came to visit Palestinian refugees displaced by conflict in Iraq. At Jeramana’s entrance lies a monument dedicated to the camp’s martyrs killed by mortars from neighboring areas. Syrian flags hold sway alongside Palestinian ones here. Further into the camp, I spot several dozen children in festive mode, sporting nationalist clothing and hoisting Palestinian and Syrian flags. One carries a large poster of Syrian President BasharAssad. The kids are about to perform in a ceremony for Yom al-Ard (Land Day) to commemorate the day in 1976 when Israel confiscated thousands of dunams of Palestinian land. They do an impromptu dress rehearsal for me before going on stage – here is the video. I follow them around the corner to their destination and am startled at what lies ahead. 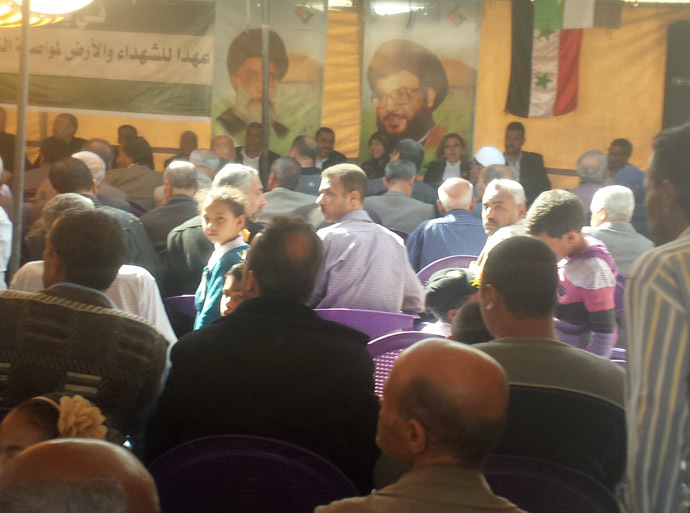 A large, colorful tent has been erected to house a crowd attending the Yom al-Ard activities – but flanking the podium inside are massive posters of Hezbollah Secretary-General Hassan Nasrallah, the Islamic Republic of Iran’s Supreme Leader Ayatollah Ali Khamenei, his predecessor Ayatollah Ruhollah Khomeini and Assad. The event, which used to be held in Yarmouk camp, has been organized by the Palestinian-Iranian Friendship Association, and has been around for at least 10 years. The event’s focus is not political, however.Its mission is to honor teachers volunteering in the camps with gifts and awards. In 2012, all the Palestinian political factions – with the exception of Hamas – signed onto two separate letters/declarations that essentially pledged neutrality in the Syrian conflict. So this visible support for the Syrian government is unexpected. Inside the camp’s main marketplace, an abundance of fresh fruits and vegetables are on display in the narrow street. Even though the camp’s population has swelled to four to five times its pre-conflict numbers, residents have adapted to the new realities in Jeramana. They, at least, still have their homes. Unlike Yarmouk, there is no visible presence of UNRWA – the UN agency dedicated to Palestinian refugees – and I am told they do not have an office here. Palestinians from other camps – and Syrians too – have flooded Jeramana in this crisis, so local “committees” step in to provide food, often daily. A committee truck passes by at lunchtime – it carries industrial-sized metal pots of home-made rice and stew to hand out to the new residents. Jeramana is one of at least 14 Palestinian refugee camps and areas in Syria, both official and unofficial. In every interview with Palestinian officials, aid workers and regular civilians, I asked for status updates on each of the camps. The responses varied sufficiently to suggest that events on the ground keep shifting, especially in rebel-occupied or surrounded camps where clashes take place between militants and Palestinian forces – or with the Syrian army on the outskirts. In Jeramana on Yom al-Ard (Land Day), Palestinians gather for a ceremony to honor volunteer teachers. The event is sponsored by the decade-old Palestinian-Iranian Friendship Association. In the Damascus area alone, there is Husayniyya (rebels occupied and ejected, destroyed), Yarmouk (rebel-occupied, 18,000 civilians still inside), SeyyedaZeinab (no rebels), Jeramana (no rebels), Khan Danoun (no rebels), Khan Shieh (partly rebel occupied, some civilians remain) and Sbeineh (reportedly 70 percent destroyed). In Aleppo, you have two hard-hit camps – Handarat, where refugees fled long time ago, has collapsed, as has much of Nairab camp. Both camps have armed Palestinian volunteer forces battling rebels. The camp in Daraa has been leveled and there have been no civilians there for much of this conflict. The al-Ramel camp in Latakia has had two major clashes in 2011 and is now fine. There is Al Wafiddine camp next to Douma, which nobody mentions or seems to know much about. The refugee camps in Homs and Hama are rebel-free and thriving – surprisingly, given that these provinces have been major anti-government hubs. I travel to the Homs camp next to see for myself. The Palestinian camp here is the only one where there is a quasi-functioning Hamas office. The resistance group and its entire official encampment in Syria left the country in 2011, so technically the Hamas reps in the camp do not serve in any official capacity. The Homs camp is starkly different from Yarmouk and Jeramana for one main reason: there is not an armed person in sight. The main thoroughfare is crowded with shops and one has to weave through the throngs of people going about their daily chores. Nothing much to see here – Palestinians in Homs have taken ‘neutrality’ to heart. My main stop in the Homs camp is to Bissan Hospital, named after a city in Palestine and run by the Palestinian Red Crescent Society (PRCS). Bissan’s chief executive is Mahmoud Darwish, whose simple office features only four pictures on its walls – two of deceased PLO Chairman Yasser Arafat, one of Bashar Assad and a map of Al-Aqsa Mosque in Jerusalem. Bissan promised neutrality at the start of the Syrian conflict, and as such, provides medical treatment to pro and anti-government fighters alike. “Their background makes no difference to us.” The hospital backs onto a Syrian neighborhood where clashes have taken place – Bissan treats Syrian army soldiers too. Darwish steps in to explain their interest in keeping the peace. Back in Damascus, I meet with the head of the Syrian Red Crescent Society (SARC). This is the group that functions as the hands and feet of the International Committee of the Red Cross (ICRC) inside Syria. It is a neutral group and goes to great pains to stay impartial so that it can operate within both rebel- and government-controlled areas. In Yarmouk and other camps, the Palestinian Red Crescent Society (PRCS) is supposed to take the field lead, but PRCS supplies and equipment were so completely ransacked by militants, that SARC has provided ambulances, medicines and aid workers to keep up with demand. SARC workers were in Yarmouk during my visit, and helped in evacuating several residents who had been approved for medical treatment. Some of the ill and injured are transported to PRCS medical facilities, but most are treated at Syrian hospitals. I meet Dr. Abdul Rahman Attar, the president of SARC, and ask him if the Syrian army ever entered Palestinian camps while civilians were still in residence. “In my opinion, no.” he says. That theme continues with everyone I ask. The only exception to this, say Palestinians of all backgrounds, is when camps are entirely empty of civilians – as in Daraa and Handarat. Only then does the Syrian army enter to fight rebels. Dr. Shaker Shihabi is the PRCS’s director in Syria and a member of the executive council of the parent organization, headquartered in Ramallah, Palestine. The PRCS runs three large hospitals in Syria: Bissan in Homs, Yaffa Hospital in el-Mezzeh, Damascus, and Palestine Hospital in Yarmouk camp. Some of the smaller clinics they used to run in Nairab, Sbeineh, Khan Danoun and Douma were destroyed in the Syrian conflict. The PRCS is one of the few NGOs still operating inside the rebel-occupied part of Yarmouk camp. They run the only functioning, non-rebel medical facility inside the camp, the Palestine Hospital. “We only have two doctors and some volunteer workers left there. We lost two doctors and five staff members in this crisis – they were killed. The last one was a few months ago – DiabMuhanna, an assistant pharmacist – he was shot outside the hospital,”says Shihabi. Earlier this year, PRCS helped in the evacuation of “more than 3,000” civilians in Yarmouk. The Syrian government gives final approval for who gets out.“They screen for fighters,” Shihabi says. 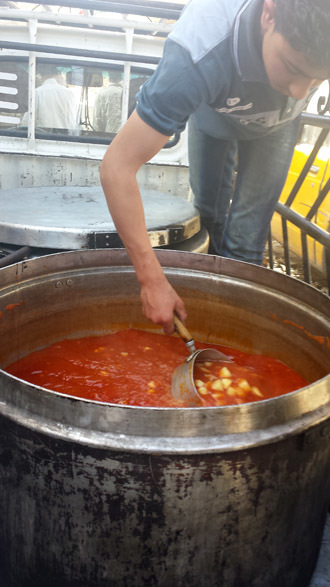 My trip to Yarmouk coincides with the arrival of an UNRWA food van at the camp. In the past year, the UN agency has relentlessly publicized the Palestinian starvation story, but left out key details. For example, food scarcity hasn’t been the issue as much as accessibility and cost. There are vulnerable populations inside the camp who cannot fend for themselves, including children, the elderly, and single parents like the woman I met whose husband vanished at the start of the crisis and who has to tend to all the needs of her two young daughters alone. In Yarmouk, food has always been smuggled in from neighboring rebel-held areas, but sellers have milked the opportunity to profit from the instability by charging staggering prices for food staples. While I was interviewing aid recipients, two separate women, one with a child, complained to the UNRWA rep that rebels had confiscated their food boxes in the past week, and asked for a replacement. The UNRWA initially refused, citing an obligation to provide its limited boxes to all residents equally, but then relented, perhaps because of media on the scene. 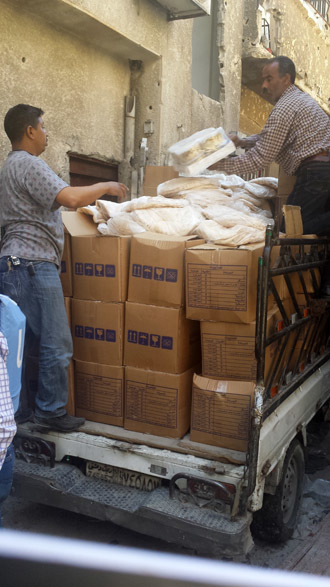 The UNRWA told me it hands out approximately 400 boxes each day they are present in Yarmouk. Armed clashes prevent it from being able to access delivery points inside the camp on most days though. On the day of my visit, its food van did not have more than 100 boxes, and during the time I spent there, I did not see more than several dozen civilians line up for these boxes. Yet UNRWA spokespeople have hit social media channels with a vengeance, loudly suggesting that18,000 civilians inside Yarmouk are somehow dependent on their food aid. This is simply false. UNRWA has not had the financial or material capability to expand and extend its operations to meet Palestinian needs during this conflict. They continue to assist with schooling, provide food supplies and medical kits, but everywhere you turn in Yarmouk, Jeramana or Homs, there is also now an adhoc Palestinian committee doing the fieldwork and cobbling together assistance. He specifically credits KindaChammat, Syria’s female minister of social affairs, for much of this. How did things get so bad for Palestinians in Syria? This is the one Arab country, after all, where Palestinians are entitled to an equal range of rights enjoyed by their hosts, with the exception of citizenship and the vote. Over the course of Syria’s conflict, Palestinian refugee camps have become active targets in every area rebel fighters could gain access. But why? What was the strategic value of entering the camps? But first, let’s correct some misinformation. Contrary to mainstream narratives, Palestinian refugees did not participate in any significant demonstrations either against the Syrian government or in favor of the Syrian opposition. Throughout the crisis, Palestinians worked in earnest to maintain neutrality and stay out of the conflict. The largest demonstrations against the government never numbered more than a few hundred people and were often populated by displaced Syrians who had moved to these camps. While also receiving food assistance from international NGOs and the Syrian government, Palestinians in refugee camps have now created locally-formed committees to provide daily nourishment for the influx of displaced persons. In fact, the most significant Palestinian demonstration during the crisis took place in Yarmouk in June 2011, after Palestinians were killed and injured by Israeli security forces during Naksa Day protests on the Golan Heights border. Events in Yarmouk that day are heavily contested. There were clashes during the funeral processions where large crowds amassed, many angry for the human loss needlessly suffered. Foreign media blamed the Syrian government for urging and assisting Palestinians to participate in the Naksa protest, but they overlooked one fact: the Syrian government, like its Lebanese counterpart, canceled the Naksa protest – most likely because of the deaths and injuries caused by Israelis the previous month during Nakba Day border protests. During the funeral procession in Yarmouk, Palestinians were mostly angry at their various Palestinian political faction leaders for encouraging – and not stopping – the Naksa incident. After that, the story diverges. Some charge the pro-Syrian government PFLP-GC with firing into crowds, but the fact remains that three PFLP-GC members were killed that day and their offices burned down. Now for a twist. A Hamas official interviewed on background tells me an unexpected version of the story. “Some Free Syrian Army (FSA) fighters went to Ahmad Jibril’s offices – the Khalesa compound – during the funeral and started shooting,” he says. He does not absolve the PFLP-GC from its role in the Syrian crisis, however. He blames Jibril’s group for not respecting the neutrality pact that Palestinians agreed upon from the beginning. By all accounts, the PFLP-GC policed the outskirts of various Palestinian camps – they say, to protect the camps from infiltration by rebel militants. Detractors insist this kind of activity instead fueled clashes and drew militants into the camps. But at the end of the day, it was Hamas that was the lone Palestinian faction not to sign the Palestinian neutrality declaration – the PFLP-GC signed on with all the other factions. There is little doubt that the PFLP-GC’s decision to take on a defense role in Palestinian camps irked the other groups. However, today, Palestinian politicos appear to be in lockstep with Jibril on the Syrian conflict. At the faction level – and even among Palestinian refugees I spoke with – there is absolute consensus on the fact that the rebels have reneged on their promises to leave Palestinians out of the crisis. Even Palestine’s Ambassador to Syria Anwar Abdul-Hadi, who essentially reports to the Palestinian Authority, sounds just like the PFLP-GC these days. That may be self-serving. The dominant Fatah faction that controls the PA has been trying to undermine Hamas for years. Abdul-Hadi explains the politics behind these actions. “Rebels killed some PLA officers to force Palestinians to help the Syrian revolution – to intimidate them. And they blamed the Syrian army. The target of this crisis is the Palestinian case. They think when they occupy Palestinian camps in Syria and divide them, they will forget Palestine,” he says. Anwar Raja, the PFLP-GC’s media director, has a lot to say about the reaction of other Palestinian factions when things first kicked off in Syria. “We warned Palestinians in 2011 and 2012 about rebels coming to occupy Yarmouk, and increased these calls as rebels took control of surrounding areas in Tadamoun, Hajar al-Aswad, Yalda. We said the groups should arm themselves in defense of the camp, but they ignored us,” says Raja. As the Arab uprisings took a sledgehammer to authoritarian governments in 2011, Palestinian refugees – like many Syrians who supported protest movements to wrench more liberties from their government – hoped for better times. There is little doubt that some were supportive of Syrian opposition aspirations. They mirrored, after all, Palestinian ambitions to achieve liberty and establish good governance. But between my two trips to the camps – in 2012 and 2014 – there has been a marked hardening of Palestinian sentiment. These populations, many of them displaced several times over now, have washed their hands of Syria’s “rebellion.” They have at times felt exploited and bullied by all parties, but have suffered most at the hands of opposition rebels. Neutrality is their mantra today. And like Syrian civilians everywhere, they want some peace. November 11, 2014 in Sryia.